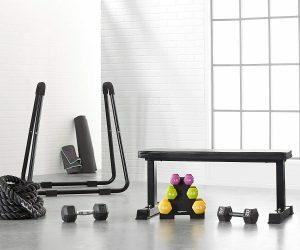 If you are looking for the best weight bench for your home gym Or perhaps you want to upgrade your current workout bench for dumbbell workout, this weight bench reivew article will help you to choose the right one for you. A home gym is not complete without a workout bench especially for dumbbell workouts. The “Best Bench For Dumbbell Workout” give you an abundance of options for different workouts and to target all the muscles across your full body. For a competent home gym, you don’t need too much space. We have shared already our best picks for the best dumbbells. But the question is what kind of weight bench you want? Is it a rigid flat weight bench or you need something more versatile like wheels and adjustable settings? All the above things depend mainly on your fitness goals and your budgets. If your budget and space is limited and only looking for the basics then go for the flat weight bench. As the name indicates, this AmazonBasics Flat Weight Bench is as basic as you get. 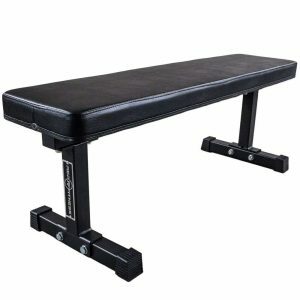 This flat bench is ideal for both beginning and advanced levels workouts. It is made of high-quality materials that include a smooth PVC top surface and a durable steel tube frame. So, if you have small space and want to dumbbell workouts on a flat weight bench then AmazonBasics Flat Weight Bench has you covered. You can assemble this bench quickly and easily. It weighs 24 pounds. Its legs/ feet are upside-down T-shaped for reliable stability. This Flat weight bench will definitely enhance your home gym workouts. 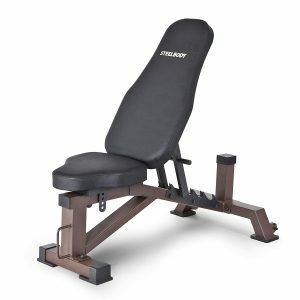 Go beyond the basics with this adjustable weight bench from Fitness Reality 1000 Super Max. It has 800 lbs real weight capacity. Smooth 12 positions independently adjustable backrest by utilizing 2 positions front leg adjustment. The Backrest positions adjust to -20 degree decline to +80 degree incline angles for a full range of motion during dumbbell exercises. Bonus: if you’re running low on space, you can fold the weight bench up for easier storage. Rep Flat Bench is designed for use with dumbbells, smith machines, cages or power racks. This best weight bench is the epitome of simple functionality. It is very strong and durable. Rep Flat Bench is constructed from 11 gauge steel, a plywood base layer, and vinyl cover. If you’re worried about sturdiness, never fear because this flat weight bench is ASTM rated for up to 1,000 lbs. The pad of this Rep bench measures 12 inches wide. The stable16-inch base makes it ideal for back support and leg drive during dumbbell workouts or bench press. It is also very comfortable to sit on. At 45 lbs, you can easily move this flat bench around your gym. You will get a 10-year warranty on the frame, 30-day warranty on the pad. This Marcy Deluxe Foldable Utility Bench has a multi-position seat and backrest angle adjustment in order to provide smooth positioning. You can easily pair this adjustable bench with a rack or cage or use it with free weights, dumbbells, barbells, or body weights. 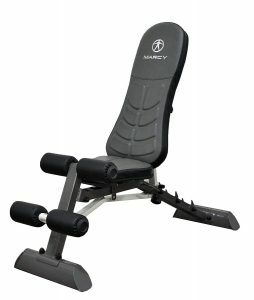 Work out in comfort with this ergonomically designed weight bench from Marcy, allows you to perform an array of strength-training workouts that focus on the arms, chest, legs, and core. This Marcy Deluxe Foldable Utility Bench offers a safe and convenient dumbbell workout in the comfort of your own home. A great home gym weight bench can pack a ton of utility into a small package. This versatile dumbbell workout bench from Fitness Reality can serve as a flat or decline bench. 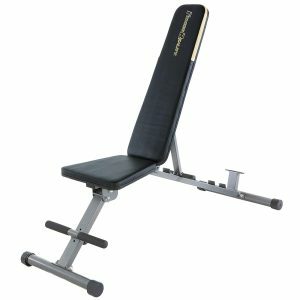 This adjustable weight bench has also attachments for exercises like back extensions, situps, and more. This bench from Fitness Reality has sweat and moisture resistant double stitched vinyl bench covering. It has 650 lbs of real weight capacity. 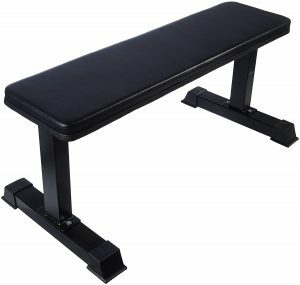 This Fitness Reality X-Class Light Commercial Multi-Workout Bench is 36 inches long with 8-12 inches wide tapered bench. You will also get a 2 1/2 inches thick medium Density foam. It’s also the best bench for dumbbell workouts. 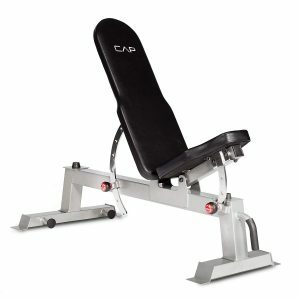 Cap Barbell Deluxe is a full-size utility workout bench. It is perfect for stretch bands for presses, flys, and many more. Cap Barbell Weight Benches aren’t just for dumbbells — the two fixtures at the bottom of this weight bench can do-everything that you will found on traditional weightlifting utility benches. This best adjustable bench also can adjust to 10 different settings and have plenty of options for your home gym workouts. You can perform a number of upper and lower body workouts. This weight bench can also be used as the center piece for core workouts. It is great for leg lifts, twists, crunches and more. No frills here — the SteelBody Deluxe Utility Bench is all about performance. The two-inch thick padding and heavy-duty steel make this weight bench a sturdy support for the toughest workouts. This best dumbbell workout bench can be used for lifting weights and strength training. The platform can be used for arm lifting exercises, ab workouts, back training, bench presses, and other workouts. This versatile workout bench can be used to train the whole parts of your body. It is perfect for beginners and long-time trainers. The bench pads of this weight bench are customizable to fit every position. You can also adjust the Backrest pad into 6 positions including military, incline, and flat. The selection of our best dumbbell exercises is totally subjective and may be up for debate. But the workouts were carefully chosen based on their effectiveness on special parts of the body. You will find these exercises very helpful for targeting each of the major muscle groups. The Dumbbell Bench Press exercise is effective mainly for the chest. It is one of the best dumbbell exercises. It only requires you to have access to a flat bench. It targets your pectoral muscles (chest), your front deltoids (shoulders) and your triceps. 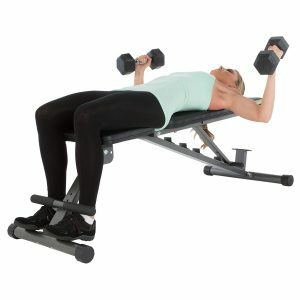 If you have access to an adjustable reclining and declining bench then you’ll be able to set up your best bench for dumbbell workout in a way that can easily perform the Incline Bench Press and the Decline Bench Press. 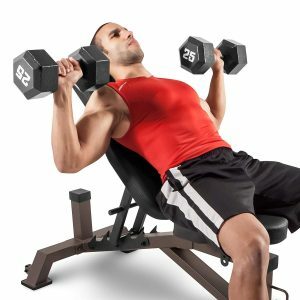 When doing incline bench press you will need to put the bench in a 45-degree angle modification will help you target the upper part of your pectorals while doing the decline bench press you will need to put the bench below horizontal that will help you target the lower part of your chest muscles. The shoulder press dumbbell workout is performed by raising your two hands at the same time. It can also be done while sitting down if your ceiling is low or even with a back-supported vertical bench if you want to remove your back from the equation entirely. You can primarily solicited the deltoid muscles (shoulders) but they’ll need help from your triceps, making this an excellent upper body workout. Alternated Biceps Curl dumbbell exercise is another classic dumbbell exercise for biceps. There are many variations of this basic dumbbell exercise but the main benefit of this exercise will remain to strengthen your biceps muscles and your forearms. You can perform this dumbbell workouts by raising both dumbbells at the same time. What you have to do is keeping your palms facing each other throughout the movement for a Hammer variation. The Triceps Kickback dumbbell exercise is for triceps. For this exercise, you will need to put your knee on a flat bench. This flat bench setup will help you perform the exercise comfortably. To maximize the result you will need to make sure that your upper hand stays still throughout the workout otherwise you’ll get your back and shoulders to help take the load off of your main target. The Lateral Raise dumbbell workout is best for your shoulder muscles, specifically your outer (middle) deltoid muscles. You can perform this exercise while sitting down or with your back supported. But bending your upper part of the body forward will give you greater fitness result on your rear deltoids, thus making it possible to target a specific part of your shoulders. The Kneeling One-Arm Row dumbbell workout is probably the best back workout one can do using a bench and dumbbell. You have to put your knee and hand on a flat weight bench that will help you targeting middle back muscles (lats) easily and effectively. While your lats will do most of the work but the rear deltoid muscle of your body will also be solicited in helping raise the dumbbell. The Lying Fly dumbbell workout will also require you to have access to a flat weight bench. It is one of the best ways to target your chest muscles. What mainly distinguishes the Lying Fly from the Dumbbell Bench Press is how it manages to remove the triceps muscles from the movement by locking them up in position for the duration of the workout. This will emphasis on strengthening your pectoral muscles specifically. You can also perform incline variation and decline variation if your weight bench allows it. The stationary lunge dumbbell workout is not always the most popular. This workout is done by adapting to strengthening the leg muscles. The Stationary Lunge exercise is easy to perform leg workout that’s exceptionally good at targeting the muscles located in your lower body (quadriceps, calves, and glutes) and a lot of athletes spanning the whole sports spectrum use it religiously. Through the Upright Row dumbbell exercise, you can target your upper back muscles, or trapezius to be specific. This workout is very effective at targeting the rear parts of your shoulder muscles and can be easily performed. Finally, the last dumbbell workout on the list is Toe Raise that targets the muscles located in your lower legs (calf muscles or calves). The Toe Raise dumbbell exercise is the most effective way to strengthen your calves which are solicited during daily activities and even in sports where running or jumping is involved.